The new businesses planting roots in Restaurant Row/Waterfront Plaza include Pacific Rim Bank. STEVEN MAIER, director of the Fine Art Hawaii studio gallery in Restaurant Row/Waterfront Plaza, has seen many businesses around him come and go as the festival-style marketplace struggled to find its niche among Honolulu retailers. "The psychology of seeing empty spaces all around you really takes its toll," said Maier, who watched two startup restaurants across the courtyard from him fail before Carnival Las Palmas moved into its new digs. 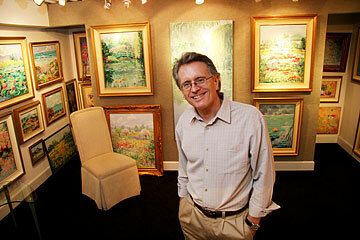 The new businesses planting roots in Restaurant Row/Waterfront Plaza include Fine Art Hawaii with Director Steven Maier. Since the Shidler Group and its partners acquired the center for about $72 million in 2004, happier times seem to be on the horizon for the Row's tenacious tenants, who hung on through the lean years that came after the downturn in Hawaii's economy following Sept. 11, the Iraq war, SARS and competition from nearby retail hubs such as Aloha Tower Marketplace, Victoria Ward Centers and Ala Moana Center. "Restaurant Row had the reputation of being a has-been spot that had seen better days, but now we're all much more optimistic," said Maier. Maier said that without the draw from the upscale Ruth Chris Steakhouse he might not have been able to keep his headquarters open. 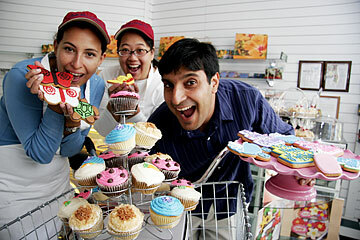 Meanwhile, new tenants such as Tushar and Ana Dubey, husband-and-wife owners of Good Kine Cookie Co., a gourmet decorated cupcake and cookie bakery, are saying that they've hit the sweet spot in their new Restaurant Row/Waterfront Plaza location. The new businesses planting roots in Restaurant Row/Waterfront Plaza include Good Kine Cookie Co., with wife-husband owners Ana Dubey, left, and Tushar Dubey with employee Bethanie Chang. In the last year or so, more than 12 new businesses have leased space in the once-struggling marketplace. Hawaii's robust economy and hot residential market, especially all the urban development in neighboring Kakaako, have created momentum and boosted the center's occupancy to around 95 percent -- a figure not seen since the glory days of the late 1980s and early 1990s. "This used to be a place where traffic was poor and restaurants would come and go, but not anymore," said Tushar Dubey, an Oahu native who left a tech career to open his dream business in the newly renovated Row. THE DUBEYS RAN their business from an Ala Moana Center kiosk and shopped around for a permanent location for six months, looking in places like Kalihi and McCully before settling on the Row for its low rent, ample parking, mix of corporate and retail shoppers and flexible landlords, Dubey said. 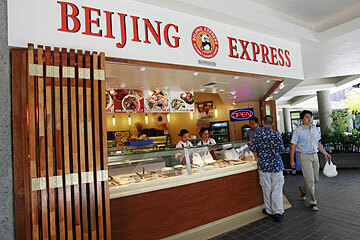 The new businesses planting roots in Restaurant Row/Waterfront Plaza include Beijing Express. "We didn't expect it because we were so new, but we had huge crowds for Christmas and Valentine's Day," said Ana Dubey, a native of Columbia who formerly worked for Time Warner, licensing cartoon characters. "We love the traffic here -- it's a good mix of corporate and retail customers," she said. Alan Beall, one of the original developers who debuted the Restaurant Row/Waterfront Plaza office and retail complex in 1987 and sold his interest in all but the Row Bar in 1991, said he's pleased to see restored vigor to his former pet project. In the 1980s and 1990s, the center was an almost instant success and patrons flocked to legendary '80s and '90s establishments such as Studebakers, the Black Orchid and the Row Bar, Beall said. "It was booming. We had almost no competition and ample parking," said Beall, who was in town last week to discuss expansion plans for the Row Bar with partner Al Sieverts. The pair are considering adding a morning coffee and tea bar and serving late lunch fare to the afternoon crowd. The new businesses planting roots in Restaurant Row/Waterfront Plaza include Chez Souvan. BUT THE UPWARD trend didn't hold and the arrival of Aloha Tower Marketplace combined with the lack of a strong anchor tenant and a downturn in the economy sent the center on a downward spiral, retail analyst Stephany Sofos said. "We had some slim years," Beall said, adding that they were augmented by the fact that the center was run by several mainland real estate investment trusts for a number of years. 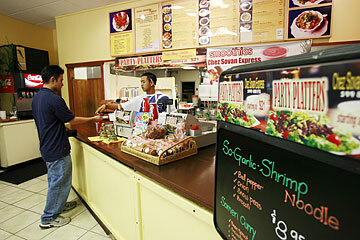 Reinvestment by the Shidler Group has improved Restaurant Row's image and boosted its chances of success, he said. "They have done a good job of bringing on some exciting new tenants and restoring the center to its original glory," said Beall, who is just one of many tenants vying to hold onto their space in the center. The turnaround in Hawaii's economy, the increasing popularity of Kakaako as a residential and entertainment complex and the ever-tightening office market enticed the Shidler Group to "jump in with both feet" and buy the Restaurant Row/Waterfront Plaza complex, said Larry Taff, managing partner of the Shidler Group. "We had been extraordinarily active in the western U.S., but until recently didn't see the investing environment in Hawaii where we wanted to be," Taff said. The Shidler Group has a portfolio of 28 premier office buildings concentrated in Honolulu, San Diego, Phoenix and Los Angeles. 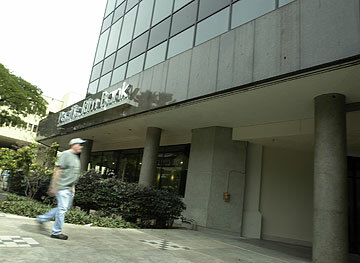 The acquisition of Restaurant Row/Waterfront Plaza made the Shidler Group the largest office real-estate holder in Honolulu, according to the company's Web site. Restaurant Row/Waterfront Plaza, which includes 95,000 square feet of retail space and 430,000 square feet of office space, was appealing because it offered a versatile retail and office component, he said. After acquiring the Restaurant Row/Waterfront Plaza, Shidler Group immediately began working on changing its perception as a tired chrome-and-glass carryover from an earlier decade. A new coat of paint, signage and outdoor furniture and lobby improvements were the first changes, Taff said. "We plan to put in about $8 to $10 million in the next 12 to 18 months," he said. ALTHOUGH THERE'S a lingering perception among certain groups that Restaurant Row/Waterfront Plaza is a failed concept, the complex's image is changing and competition for the few remaining slots is fierce, he said. Shidler is actively recruiting new industries such as biotech and the medical business for the office space and more high-end entertainment and restaurant venues to serve the complex's growing corporate population, which includes the Honolulu Star-Bulletin. 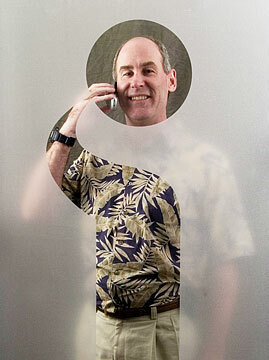 The new businesses planting roots in Restaurant Row/Waterfront Plaza include Mobi PCS with Chief Executive Bill Jarvis. "We offer more space and a better parking ratio than any other building in the central district, and we're flexible on doing startups and startup leases," said Craig Neher, leasing director for Waterfront Plaza. THE COMPANY is also seeking a celebrity chef to develop an anchor restaurant in prominent wrap-around space recently vacated by Jose's Mexican Cafe and Cantina, he said. "Ruth Chris has proved that we can deliver sales on a square-foot basis," Neher said "They are the most successful Ruth Chris in the country." Bringing in Pacific Rim Bank as a ground-floor anchor and securing a deal with a celebrity chef would shore up the complex's bid to become a residential/retail/entertainment/office hybrid where people can live, work and play, Sofos said. "Shidler has finally gotten everyone together and has united its office and entertainment/ restaurant component at a time when residential is taking off," she said. "I think it will work this time around as long as they offer specialty shops and modern and exciting restaurants." 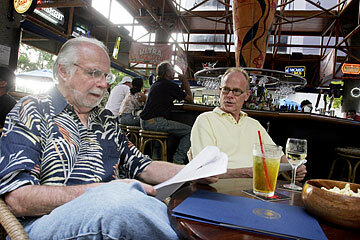 Alan Beall, left, president of the Beau Corp. and half-owner of the Row Bar, meets with partner Al Sieverts to discuss reinvestment in the bar and the return of Restaurant Row to its glory days. Beall was the original developer of Restaurant Row, which opened in 1987. These are some of the predominant businesses that have been added since the Shidler Group came purchased Restaurant Row/Waterfront Plaza in 2004. The Shidler Group is trying to reposition the complex to cater to a higher-end corporate crowd.